In a recent article, Shotokan karate expert Rob Redmond asks whether the self defense applications (bunkai) of kata (practice forms) have any real historical roots or if most of the ones taught today are just newfangled techniques that have been created to keep up with the current trend of reality fighting. Redmond maintains that there is at least a new and growing interest in the discovery and meaning of karate's kata applications. One of the tenets of the traditional camp is that the essence of true karate is martial in nature. Karate's deadliest techniques are to be found in its bunkai, not on the tournament deck. "We can't use real karate in sport" rings true. On the other hand Musashi's sage advice "How you train is how it happens" is exemplified in stories of certain black belts getting walloped in street fights. Much of this has to do with training methods that have developed over long periods of time. As Forrest Morgan points out in Living the Martial Way, "...for all the hoopla about training and techniques, most martial artists can't really fight." Historian Donn Draeger once noted that the goal of training in the budo (martial ways) is to embark on a path to self-perfection. In this way, actual fighting prowess is acquired only as a "by-product." As I see it, most martial artists aren't really seeking something as lofty as self-perfection from their training. Self preservation is more like it, and that's where the bunkai of karate forms practice comes in. I think most of you would agree that there's a strong correlation between what's shown in bunkai and close quarter self defense. So are karate students learning "ancient, hidden" techniques encrypted in kata that date back to antiquity? Many of karate's earliest pioneers in the West had only a pedestrian's understanding of kata and its applications, at least in the beginning. I've talked with a number of long time practitioners who swear that the level of bunkai and kata training available today far exceeds what was taught years ago. Whether this is in response to the immense popularity of mixed martial arts or other styles remains unclear. For now it seems we have the innovation of creative (and hopefully proficient) karateka who may be just trying to keep up with the Jones' as it were. I see nothing wrong with that. Innovative modern techniques presented within the context of traditional kata sounds like an idea whose time has come. I felt like Mr. Redmond's article needed a terrifically long answer, or none at all. Without saying too much here--I may write up a short little comment to put on his blog later--I couldn't help but wonder at some of his thinking. After all, Funakoshi himself said very clearly in his autobiography that the karate then practiced in Japan was a long way from the karate he had learned as a youth in Okinawa, and that he had deliberately simplified the kata--presumably to make it easier to teach large numbers of people. Now, call me a rube, but it seems to me that when you look at the kata in Karate-Do Kyohan and then look at the corresponding kata in Nagamine's The Essence of Okinawan Karate-Do, as well as what's been published elsewhere, it seems to me that there's just not that much difference in the movements themselves. The simplification that Funakoshi refers to, then, seems very likely to have been in the applications of those movements. In his book, Choki Motobu referred to Naihanchi, Patsai, Chinto, etc., as each being "styles" of karate, each form containing a complete system of self-defense. This scarcely seems possible unless there was a whole lot more to their interpretation than has been commonly acknowledged over most of the last seventy years or so. One of the reasons I switched from Taekwon-do to Okinawan karate was because of the demonstration of these allegedly new bunkai; at every turn, what I was shown had the look of being, as my instructor says, "intuitively obvious." I was constantly struck with an overwhelming sense of "Of course! That makes sense!" To my mind, the bunkai that I was taught in Taekwon-do (which at that time was little more than Koreanized Shotokan) now seem stiff, unworkable, and unnatural in comparison. I'm learning that in the taijiquan I'm studying, every movement in the long form as at least one, and probably several specific martial arts applications. There's much more to it than just moving around slowly. I've always thought if Kata as the Foundation/Basics of learning. 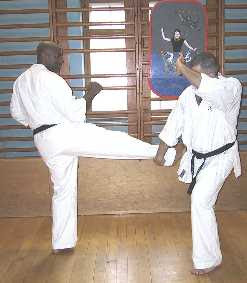 Kata at most is only an example of some techniques and demonstrate some scenarios. It serves as a guideline for all beginners and advanced practitioners. Thanks for leaving the comment on my blog. I have a training plan to get back in shape enough to train Jiu-Jitsu again. Just hard to fit it in with work, kids, etc. I too appreciate many styles of Martial Arts. I try to explain to many of my MMA friends that people study martial arts for different reasons. Not everyone has ambitions of fighting in a cage. Anyway, thanks again for the comment. I'm looking forward to checking out your blog. It looks like you have a wealth of information out there. I agree. And this isn't the first time I've heard of individual karate kata being referred to as complete fighting systems unto themselves. Still, it seems like a bit of a stretch. The thing that I liked about Redmond's article was two pertinent questions he raises: 1. Is there any historical significance to the bunkai that is being taught today and 2. Why is there now such a strong interest in learning these applications? They're good questions given the changes we've seen in the martial arts over the last 15 years or so. I think what he was implying was that modern practitioners may have an edge in figuring out these applications, possibly more so than their fore bearers on the other side of the pond. Don't forget that most of these forms originated in China, so it was still up to the Okinawans and Japanese to put the pieces together. Now it's our turn, and what's being revealed today probably has nothing to do with lost teachings, hidden meanings from the past or whatever. in the taijiquan I'm studying, every movement in the long form as at least one, and probably several specific martial arts applications. Most people don't realize that tai chi - or more specifically taijiquan - has distinct combative roots. From what I understand the Long Form (or at least a version of it) is like 30 minutes long! That's got be a quite a catalog of techniques. Right. At first, performing kata is awkward, like learning anything for the first time. After a while it becomes necessary to unlearn it, so to speak, where it just flows out effortlessly and unconsciously. Hmmmm. I see where you're coming from. Let me, without pretending for a nano-second that I have any qualifications whatsoever, see if I can toss a couple more ideas out there. ...this isn't the first time I've heard of individual karate kata being referred to as complete fighting systems unto themselves. Still, it seems like a bit of a stretch. Well, yeah, I can certainly see that, given the relative brevity of the form. To a degree, it's how you approach it. My instructor says that you are beginning to get the hang of kata interpretation when you have a minimum of one workable block, one workable strike, and one workable tuite technique for each movement. It's not so much that this movement definitively means that as it is that it serves as an overall mnemonic device. And then there's the performance of the kata itself. The movements can be, of course, performed with different timings, so that in timing one, for example, the first three movements constitute one self-defense technique; in timing two, you might find that movements one and two are one technique and movements three and four are another. And then there are the alternate versions of the kata. Just in the last few weeks, I've seen two different timings of Naihanchi Shodan, "Naihanchi turnaround," which simply has to be seen to be believed, and "Naihanchi shuffle," which is all about helping you maintain your preferred combative distance. There are at least ten more timings of Naihanchi Shodan, each with its own repertoire of techniques, which I've yet to be shown. Looking at an individual kata that way, as something that reveals something different depending on how you unfold it and look at it, you can see how there might be untold numbers of techniques in just one kata, how each one of them can be thought of as a self-contained system. The thing that I liked about Redmond's article was two pertinent questions he raises: 1. Is there any historical significance to the bunkai that is being taught today? As far as when these techniques began to be introduced? I don't doubt for an instant that they've been around forever. It's not hard to come to this conclusion. Seiyu Oyata brought these techniques to the U.S. in the mid-seventies (not entirely a coincidence that the interest in tuite and kyusho really started to take off at that point); he says he learned them on Okinawa in the forties. Who am I to tell him differently? Seikichi Uehara has been teaching similar techniques for decades. I read an interview--originally done in Spanish--with Hohan Soken wherein he eventually started illustrating his points about tuite and kyusho on the interviewer. Soken said he learned those techniques from his uncle. When you read Mark Bishop's Okinawan Karate: Masters, Styles, and Secret Techniques, you can tell from his stories of some masters that they know something of kyusho and tuite, in some cases more than they're willing to let on. Then there's all the chin na people. They certainly are convinced that their techniques and interpretations go back centuries. 2. Why is there now such a strong interest in learning these applications? If these techniques and interpretations have been around so long, it's legitimate to ask why they've only recently begun to become more widely known. I think a big part of it has to do, again, with Seiyu Oyata. Once he started teaching this material more openly, I think others who had some of this knowledge had to quickly conclude that "the cat was out of the bag" and start teaching it themselves lest they be thought less knowledgeable than they really were. And, too, there's the fact that knowledge is simply much easier to disseminate today. Once even one person says, hey, my teacher showed me this, next thing you know, five hundred people around the country have picked up the technique. I like the focus of this posting, and I love the questions that both you and Sensei Redmond are posing. I believe that kata bunkai is becoming similar to an unraveling of a puzzle that has already been solved. We are trying to figure out, with the skills that we have acquired on our own, what the originators of these kata were trying to teach through the patterns. It's not like we can turn to history, or to the founders of the various arts to ask them. We can only lean on what people say others have said, or done. I do not think that karate students are learning "ancient, hidden" techniques, but more that they are noticing similar concepts to what they have found "works" within the limitations of a human body enclosed in the movements of the pattern, and recognizing them. After reading some of the postings in the links I have a few points where I strongly disagree with what he has to say yet it would be a lengthy article so I am saving it for my own blog posting. One of the tenets of the traditional camp is that the essence of true karate is martial in nature. Here I agree and disagree. I do not believe karate is martial in nature. It is both a path to betterment for the individual and it is a form of combat. In the definition of martial I do not believe that karate from Okinawa fits in relation to those art forms from Japan which do fall into the martial category. Karate's deadliest techniques are to be found in its bunkai, not on the tournament deck. This is true and not true from my perspective. Bunkai can be techniques used in tournaments and it can be those used in combat. It depends on your goals in practice. I believe this is that which should be explained to beginners. Do you want to practice karate-do, karate supo-tsu, or karate-jutsu? They should understand it completely and know the repercussions of which practice they choose. No one wants to find out that what they practice does not work when confronted by a life or death situation. I am not saying that all of the above ways can or can not be effective in combat yet the tournament version has the least likelihood of being effective due to its practice. "...for all the hoopla about training and techniques, most martial artists can't really fight." This I agree with for the previous comments reasoning. A lot of practitioners who are of the tournament group who do not understand that what they practice is not necessarily combat ready sometimes feel because they wear a black belt they are invincible. This is why I preach the do, jutsu, supo-tsu comment before they reach that level. As I see it, most martial artists aren't really seeking something as lofty as self-perfection from their training. Agreed, most seek fame and fortune in trophies and titles. I think most of you would agree that there's a strong correlation between what's shown in bunkai and close quarter self defense. True, if the teacher is well trained in what it takes to actually survive in combat. Combat, regardless if it is military in combat or cops in combat on the street or most of us in street self-defense the teacher must understand what it takes to face real combat and teach it properly. I feel very few are qualified to actually teach real life combative karate. So are karate students learning "ancient, hidden" techniques encrypted in kata that date back to antiquity? Not even close. The Marines who brought karate, as well as others, were taught in a short period of time and started dojo where no bunkai were taught. It has been this resurgence of kata and bunkai that has brought out kata bunkai teachings. There may be a few dojo who had old Okinawa "Ti" instruction yet the bunkai is still modified by each practitioner to fit into today's combat situations. I firmly believe in kaho/keisetsu as my blog has shown in the past. I use it exclusively to teach jutsu. Yet, the bunkai I teach is also a collection of my learning over the years and is now suited to my teaching style. In the end I hope my students end up doing the same, i.e. discover their own bunkai as it applies to them in their day and continue on from there. I do not believe that Tatsuo Sensei retained the old bunkai from the kata he took and modified for Isshinryu and I believe that is a good thing. The bunkai of yesteryear is not always completely valid for todays combat. I've talked with a number of long time practitioners who swear that the level of bunkai and kata training available today far exceeds what was taught years ago. Whether this is in response to the immense popularity of mixed martial arts or other styles remains unclear. MMA, in my humble opinion, has nothing to do with kata and bunkai as taught in karate-do. Time and again when a MMA practitioner is exposed to such traditional ways of teaching they either are surprised or take the "it doesn't really work or it is worthless training" attitude. I realize there are some MMA persons who started in a traditional form of training such as this discussion yet most have not. The one's who have I feel have a distinct advantage over those who did not. Thanks for the outstanding post John Sensei. It's not like we can turn to history, or to the founders of the various arts to ask them. Makes you wonder what they would say, right? Even some of the founders, especially the more recent ones like Parker, Lee and Shimabuku espoused change. Change is usually good, but for sure it's inevitable. I think MMA has much to offer. It's true that it lacks the philosophical essence or do aspect of the martial arts. The main gist of my article (and to a degree Mr. Redmond's) was that MMA's presence has caused traditional karate to rediscover its jutsu roots from a modern approach. If what I understand is correct, per Draeger Sensei, this corrupted form of karate started during the Tokukawa period. So, that would seem a very long time to have lost the value of bujutsu bunkai in the art of the empty hand. I seek self-being. I seek self awareness. All I know is that when I train, everything else goes away. That is motivation enough for me. All the rest is a by-product. Happy new year, sensei John. May 2008 bring you lots of happiness, love and revelation. Thanks Mat. Same to you. I think you are right in what you say. Kata is only within the last few years starting to get the recognition it deserves as very realistic bunkai. An interesting read on bunkai from past years is a book by Sensei Bruce Clayton called Shotokan Sectrets. my northern shaolin teacher, when asked how to handle various locks and situations we found in MMA fights, answers not from creativity, but with reciting a counter move from memory, with its exotic kata-move name(its from history). Unlike today's many test-and-try styles and teachers in the west(which works! ), eastern masters of old is like a huge library of kata and its bunkai, each with different poem and cultural background that is created to handle every situation. Great post. You've really hit the crux of the traditional martial art vs. modern combatives argument. For myself, I believe that the worth of my kata is completely in my own hands; it's based on my own understanding of the interpretation and application of the form's movements. I can choose to follow a very tight interpretation where every motion exactly fits the movement of the form, or I can choose a loose interpretation that only approximates the movements. Since, ultimately, it's up to me to defend myself, I reserve the right to select kata interpretations that best suit my needs. I don't need to worry about what my instructor, the guy next to me in class, or Tatsuo Sensei would do against an attack, I only have to concern myself with what will work for me, in my situation. So to answer the question: Are karate students learning "ancient, hidden" techniques encrypted in kata that date back to antiquity? In truth, I don't know. I can't be certain that the interpretations or applications I practice have any historical significance. I only trust that they can help me to defend myself and the ones I love. I believe that the worth of my kata is completely in my own hands; it's based on my own understanding of the interpretation and application of the form's movements. Right, that's really the place we all want to arrive at eventually. Kata means form, but the bunkai should be tailored to our natural tendencies, making the movements "formless." Over time, it should become an individual thing. The problem with the way kata applications are presented (sometimes) is that it tends to preclude personal expression, but obviously it doesn't have to be that way.